The elegant DECT handset OpenScape DECT Phone S5 supplements as cordless DECT handset the Unify offering for mobile solutions on-campus/ in-house with the OpenStage SL4 & OpenStage M3 family on the Unify Platforms with HiPath-/OpenScape- Cordless solution. The OpenScape DECT Phone SL5 boasts the largest screen with our slimmest and smallest cordless handset, all without compromising high end functionality, security, aesthetics or design. The OpenStage SL4 professional is the slimmest and smallest DECT cordless handset in the portfolio; it satisfies the most stringent requirements in terms of high end functionality and design and suits perfectly to various jobs. From the high-quality handset with galvanized keys, to the large 1.8 TFT color display with modern user interface, this handset looks exquisite. As well as great style, it offers optimum functionality, with excellent voice quality, Bluetooth Interface and a 2.5mm headset jack. The OpenStage SL4 professional is the successor of Gigaset SL3 professional. 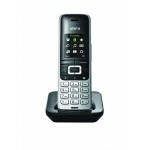 The Gigaset S4 professional is the elegant DECT cordless handset with top-of-the-range features. From the high-quality handset with galvanized keys, to the large 1.8-inch TFT color display with modern user interface, this handset looks exquisite. As well as great style, it offers optimum functionality, with excellent hands-free, Bluetooth Interface and a 2.5mm headset jack. 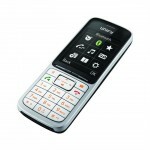 The Gigaset S4 professional is the successor of Gigaset S3 professional. The OpenStage M3 DECT handsets are a family of wireless devices designed to perform in harsh environments. The family comes with variants covering different alarm options and also use in potentially explosive environments where moisture, dirt, shocks or high ambient noises could compromise communication quality. With its device protection class of IP65 it suited perfectly for these scenarios. Although the OpenStage M3 family is designed for these environmental conditions, it looks exquisite with its large 1.8 TFT color display and with an up to date user interface. As well as great style, it offers optimum functionality, with excellent voice quality optimized for noisy environments, Bluetooth interface and its black/silver color. The Siemens Gigaset M2 Professional is suitable for the roughest environments, thanks to its built-in protection against sprayed and splashed water, and a dust-proof, impact-resistant, shatter-proof casing. Charger for the Siemens Gigaset M2 and M2 EX Professional handsets. 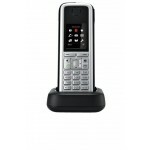 Gigaset S3 Professional is a telephone system based on the DECT and GAP standards for connection to the analogue interface of the following HiPath systems: HiPath 580 HE600S.10.73 or later, HiPath 3000 V 7.0 R1.3.000 or later and HiPath 4000 V 2.0 R12.0.0 or later. Gigaset S3 Professional is a telephone system based on the DECT and GAP standards for connection to the analogue interface of the following HiPath systems: HiPath 580 HE600S.10.73 or later, HiPath 3000 V 7.0 R1.3.000 or later and HiPath 4000 V 2.0 R12.0.0 or later. 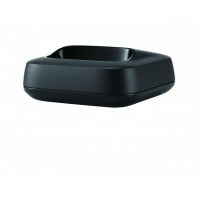 Gigaset S300 professional is a desktop device with a cradle for the Gigaset SL3 professional handset. Excellent voice quality and high immunity to eavesdropping are prominent features of this system. Colour: Silver Warranty: 1 Year The Siemens Gigaset S2 Professional iDECT handset is a feature rich phone for at-desk and mobile use in companies. It helps ensure workflow continuity, even when workers are frequently on the move.